My fellow Tropicans, ask not what your country can do for you, ask what you can do for El Presidente! I’ve had a few visits to Tropico over the years, but I never truly accepted the glorious leadership of El Presidente until my fourth visit there. I put more hours than I am willing to admit to into Tropico 4 and as a reward for my unstinting efforts, collected all the achievements the game had to offer. Back then, many of my islands were poorly planned and basically about one election away from disaster or were non-sustainable. This state of my affairs didn’t really matter or cause much concern since El Presidente was still victorious in his own agendas including a healthy Swiss bank account to show for his efforts. I bought Tropico 5 as soon as it was released and found the strategy of “exploit them then leave them to burn” didn’t work so well as you re-visited your islands later on. This left me problematically struggling to fix older things up as well as complete the current objectives. It was lots of fun and I liked that my actions in the past had consequences in the future, but I still liked the flow of Tropico 4 better than Tropico 5. 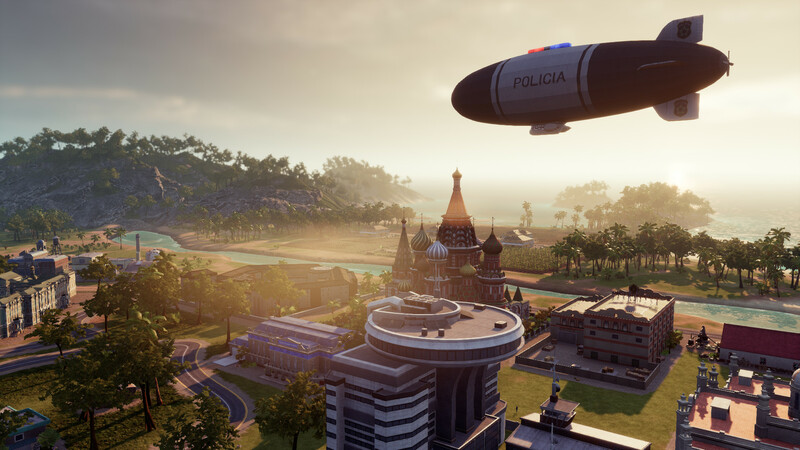 Tropico 6 is based on Penultimo’s disjointed recollections of El Presidente’s former glories and is probably Tropico in its purest form. There are four eras in which His Gloriousness El Presidente rules over the many islands of Tropico. Each one brings with it a change in technology and global powers. Modern advances occur that can change up how things were done. The prime example of this is the farm. Farms spread out over a large area and you need to place them in areas where the land will support the type of crops you want to plant. This means you might have to search around a bit and possibly bulldoze a hospital or two in order to find the best place to grow your tobacco. Although it hurts him deeply, these are the sacrifices El Presidente is willing to make for the good of Tropico. The fact that his Swiss bank account will grow fatter and juicier from tobacco sales or other businesses selected carefully by His Gloriousness of course does not affect his decisions at all… Once you have hit the modern age, hydroponics allows you to place a farm anywhere you want and it will take up a lot less space meaning that you will have plenty of room to place your weapons factories and rum distilleries and possibly even replace that hospital your bulldozed earlier. If you are playing the campaign, each mission will have one or two eras for you to play through. Each mission will also have an intro and outro by Penultimo as well as key objectives for you to complete. The very first memoir is how Penultimo first met El Presidente. Back then the Crown had El Presidente under their thumb, but after a while El Presidente managed to declare independence. While the story is more just there to add a layer of flavor to the game, it is full of the Tropico humour I have come to be quite fond of. Some of the demands and random dialogue that isn’t based on the actual story can get very repetitive after a while but it was definitely amusing the first few times around. I won’t spoil any of the jokes or the story, but there is enough thematic variety going on to keep the game fun for quite some time. The missions for the most part can be played in whatever order that you find most convenient. To add a little interest, some of them require you to have completed a certain number of missions before you can play a particular mission but it doesn’t matter which ones you have already completed. 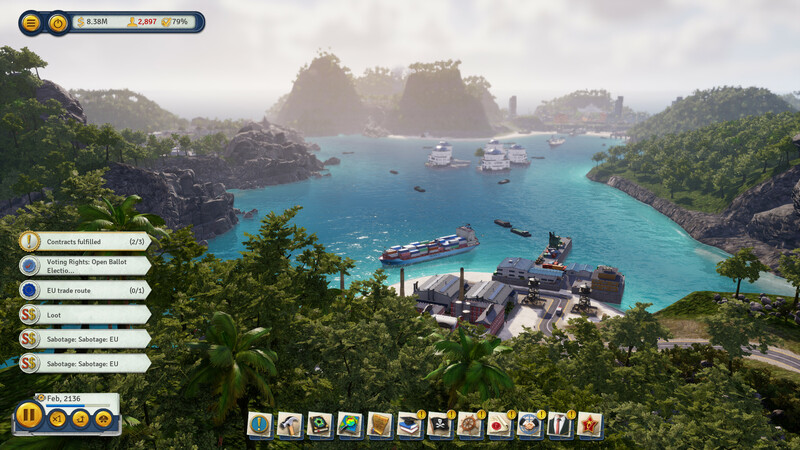 The actual gameplay of the Tropico series is a city builder focused on generating profits and completing objectives while at the same time managing the population. How you manage the population is up to you, but the Tropican people will likely remember what you did when it comes to election time. Sure, being the fair and just El Presidente you could allow the people to have their vote. On the other hand… knowing that your people love you and treasure you means you can also decide to not to bother having an election. That way once the people realize they were wrong to question your leadership decisions, they can then be freely allowed to vote for you once more rather than being executed. There is also a customizable sandbox to play around in as well if you are the kind of El Presidente who doesn’t like other people bossing you around. You are able to configure quite a few settings to tailor the experience to your liking, including setting your own victory conditions. Let’s talk about what is most important to El Presidente… which Penultimo informs me is the people of Tropico and definitely not money and power. If you look into the menus you will quickly find yourself overwhelmed with the sheer amount of data you have at your fingertips. You can drill right down to a single citizen or look at the populous as a whole. Do you have someone who is unhappy about how you are running the show? Have them arrested or perhaps just arrange for an accident to silence their protests. Soon there will be no one left to oppose El Presidente if there is no one left on the island! That’s the kind of brilliant strategy that has led El Presidente to be the greatest leader of Tropico in recorded history. All history of the persons ruling Tropico before El Presidente were tragically lost in the fire during the celebrations of El Presidente’s greatness, but Penultimo assures us that he has both recovered from his mysterious burns and that El Presidente is the greatest leader the world has ever seen. Carefully managing the various statistics will ensure you have a long reign of power. If you let the people’s problems fester for too long you will find them holding protests, turning to rebellion or actually daring to vote against you. Different factions exist as well as different world powers depending on which era you are in. Keeping everyone happy is quite difficult especially when they like different things. Pleasing one group likely will displease another in some way. Luckily you have multiple ways to make it up to them so odds are you should be able to reach a happy medium. In the very least, you might bribe their leaders enough that they will support you despite the fact you have pretty much done everything you could possibly do to alienate them. As for the world powers, trading with one generally reduces your standing a bit with another. Luckily you gain more from the trade than you lose from the other power so if you want to cut your losses you can always just trade with both. Nothing wrong with selling weapons to both sides in a war, that way it doesn’t matter which side you backed, you picked the winner! Plus, odds are your weapons won’t work anyway, so you are saving lives. El Presidente is a war hero! If one side does start to see your true colours a little too much, you can always bribe them as well. A little grease to the right palms will keep the sun shining brightly on Tropico. 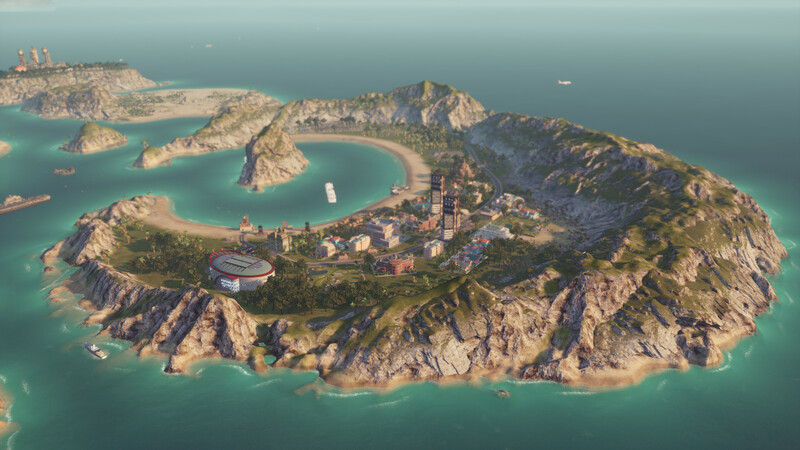 A new feature in Tropico 6 is the raids. Rather than just earning resources, blueprints, review scores and famous landmarks the old-fashioned way, you can send out a raiding party to get those things for you. You know that lion with the human head in Egypt? The Sphinx? Well clearly, they can’t take care of it properly as is quite evident by its lack of a nose. Why not bring the Sphinx to Tropico where El Presidente can ensure it will come to no further harm! Probably should rescue the Statue of Liberty too while we are at it. 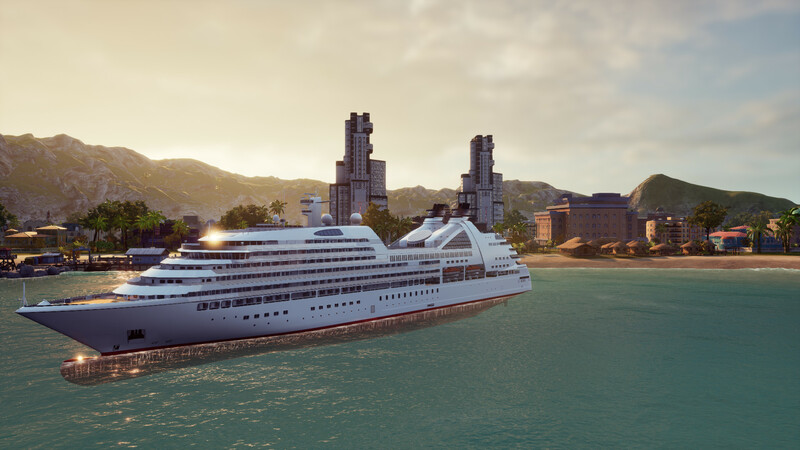 By bringing all these landmarks to Tropico, you are setting yourself up to be a vacationer’s paradise and saving them a bundle of money in the process! 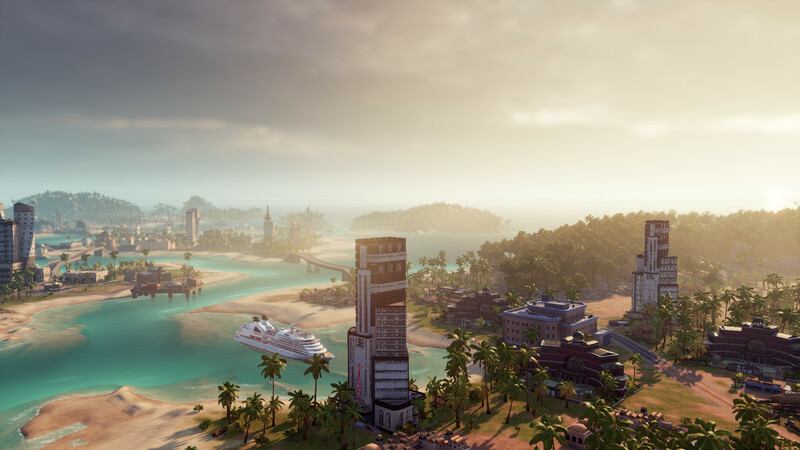 Why waste time and money travelling all over the world to see these sights, when you can just go to Tropico and see them all! El Presidente is thinking of you, the people of Tropico and the world! 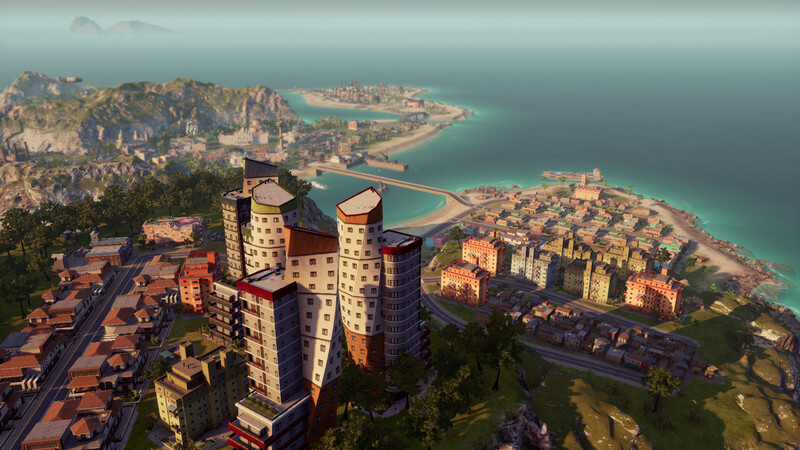 Graphically this is the best-looking Tropico game to date. There is a wide variety of islands in the archipelagos that will help make your city planning both interesting and strategic. You will need to build tunnels through rock, bridges over water, and generally find your way to navigate around the map. There are sufficient details that you are able to find the building you are looking for just by looks without needing to click around too much. Thanks to the overlays, you are generally able to find where you need to put your buildings to maximize effect. Perhaps you have a high crime area and a low crime area and one of the factions is demanding you build a police station. Well that police station reduces the liberties of those living nearby, so you are better off sticking the station where it is needed most rather than just randomly placing it. This will make it so the liberties are not hurt in the peaceful area and the crime rates will decrease in the trouble area even if comes at the expense of big brother always watching them now. Each of the characters in the game is represented by a picture for the most part, but each picture really helps sell the kind of person you are working for. It’s a hard game to rate graphically, but for the genre it looks exceptional. There are clipping issues with the ships and bridges, and I once saw a fleet of boats drive across the land, but these minor issues can be forgiven. Another thing that helps make the game look good is the fact you can customize El Presidente and the palace as well to suit your taste. There are a number of uniform components and accessories for you to choose from and you can even choose to be La Presidenta if you are so inclined. As for your palace you can decorate the yard, change the building style, change the building materials for the palace and the yard as well as change the colours to whatever you want them to be. You will be able to unlock more customizations as you progress through the missions. The sound track is suitably tropical sounding. While it isn’t overbearingly so, it is a bit repetitive. 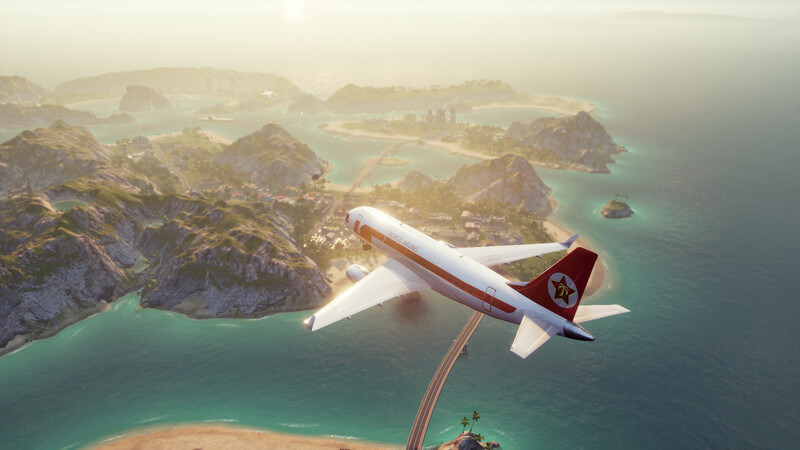 The sound effects help make Tropico feel more alive, as well as help draw your attention to things that are going on in your world. Each time a demand/story screen pops up, there is generally some spoken dialogue as an introduction to the screen that is currently up. For repeat requests this can get a little tiresome but I would much rather have it voices than not voiced. I just wish there was more variety, but still, I’m just glad there is something there to enjoy. I recall playing Tropico 3 after playing Tropico 4 and I found the silence to be a bit off-putting. The game was still enjoyable and the radio station still was voiced, but overall, it really needed those sound bites to help keep you in the moment. The controls in the game for the most part worked well. There were a few times when things didn’t go quite as I meant them to, but that was mostly my own fault I believe. The UI isn’t without its faults either. I played the game prior to launch primarily and a little bit after launch, but a common issue I found was with the modernize all button for the farms. Basically, if you have a bunch of the old-style farms and you have enough money, you can hit the modernize all button and it should replace all your old farms with new ones. For some reason when I did that it seemed to just take all my money and left the farms the way they were. If I did the control-click of the modernize current building option, that seemed to make the function work properly. Another thing that I found slightly annoying occurred when a world power’s embassy asked me to build a specific building near their embassy. The issue was that due to me making zones or otherwise trying to layout my city in an orderly fashion, there was nowhere to place the building they wanted near their embassy. This leads to you having to bulldoze the things you wanted to have placed in certain locations in favour of their building. Some buildings you can relocate for a fee, but not all of them. Overall though, the interface of the game works very well. The menus allow you to easily navigate and find what you are looking for. I wasn’t able to find a specific building locator option though, but if would be nice if it was there. There was one mission I recall where I had to bulldoze key buildings and for quite some time, I couldn’t find the last one I wanted. 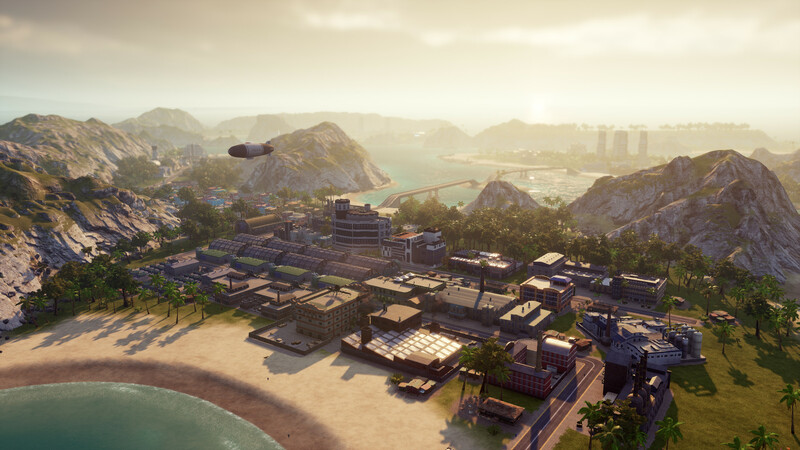 Tropico 6 also has online multiplayer, but at the time of writing this review I have not had a chance to play an online game. It is definitely something I plan to try in the future, but due to the game being brand new out, there wasn’t much available to play at this time. 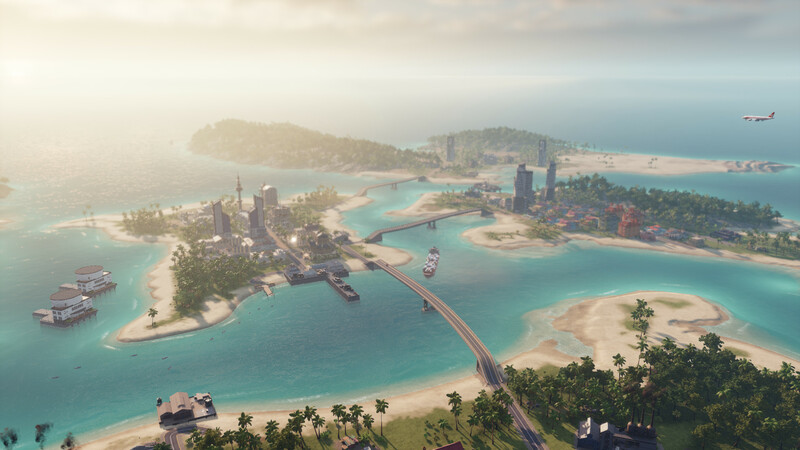 So, should you pick up Tropico 6? 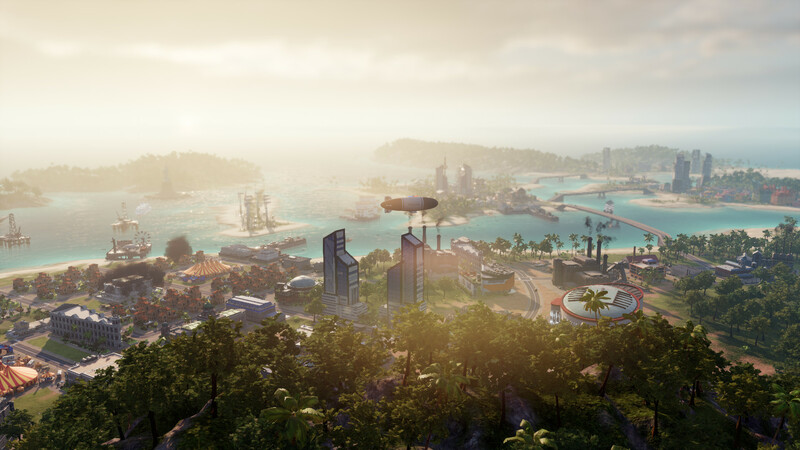 El Presidente has released an edict that says you must purchase Tropico 6, so it isn’t like you have much of a choice! You wouldn’t want to defy El Presidente would you? Of course, you wouldn’t! You enjoyed your previous visits to Tropico so you should definitely get your passport in order and revisit! El Presidente promises not to have you assassinated while you visit, although you know accidents do happen. If you enjoy city builders, you should certainly checkout the nouveau Tropican architecture; it is vastly superior as it doesn’t bother with smelly rooms like bathrooms. That’s less cleaning that you need to do! Also, if a structure burns down, it is cheap to replace due to the lack of pesky building inspectors complicating things with their mountains of paperwork. If you have never visited Tropico before, now is your chance! We just built a shiny new hotel and it’s handily landfill adjacent so you don’t even need to walk far to throw away your travel sized bottles of soap! That’s unheard of convenience! All hail His Wonderfulness’ El Presidente! 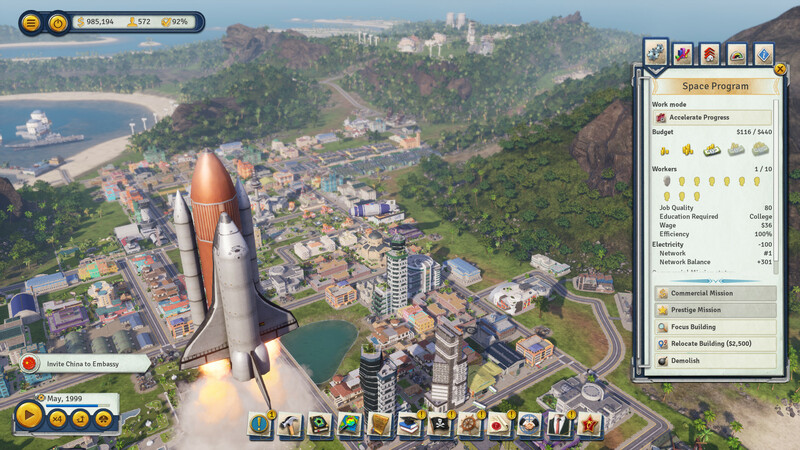 Visit Tropico 6 today or else! I'm a Professor. When I am not teaching people random things I am writing about random things, mostly reviews. I'm into Role-Playing Games, Real-Time Strategy, Open World Action-Adventure games to name a few. I'm generally willing to try anything that is different from the norm as well. I'm also selling these fine leather jackets.